Showing 12 articles from March 29, 2015. SOUTH BEND - The Pacific County Commissioners met on Tuesday March 24, with a full house filled with members from the public, Pacific County staff, along with Timberland Regional Library staff from around the county. Carol, the Timberland Regional Library's Pacific County representative, presented the highlights of 2014, citing their addition of hours to all of the libraries across the county as well as the launch of their digital magazine system, Zinio, where you can access digital copies of thousands of magazines, to the wireless printing they have distributed to the Pacific County Libraries. SOUTH BEND - Pacific County Sheriff Scott Johnson has severed the employment of Undersheriff Todd Fosse. State shellfish managers have approved a week-long series of razor clam digs starting April 4 at four ocean beaches. Raymond Senior Benjamin Meade has taken on the second annual Run Bright 1k, 5k and 10 k run/walk as his senior project, in order to raise money for the Raymond High School Cross Country Team. Barbara Bolden of Willapa Harbor Helping Hands accepts the check from Kerstin Jones. Jones was able to make a donation of over $1,200 to the charity after all expenses were paid to put on the cultural event. For Willapa Valley high school senior Kerstin Jones, she was able to raise $1,268 for her charity Willapa Helping Hands from her senior Powwow Project. Ilwaco easily defeated Raymond in golf Monday afternoon at Willapa Harbor Golf Course. Willapa Valley's Nicholas Betrozoff shot a 41 for medalist honors, but the Ilwaco squad won the match 213 to 279 versus Raymond. The Lady Fishermen turned in a team score of 246. North Beach defeated Raymond by 15 strokes in a boys match at Ocean Shores Golf Course March 19. The Hyaks shot a team round of 225. The weather had moderate wind with occasional showers. 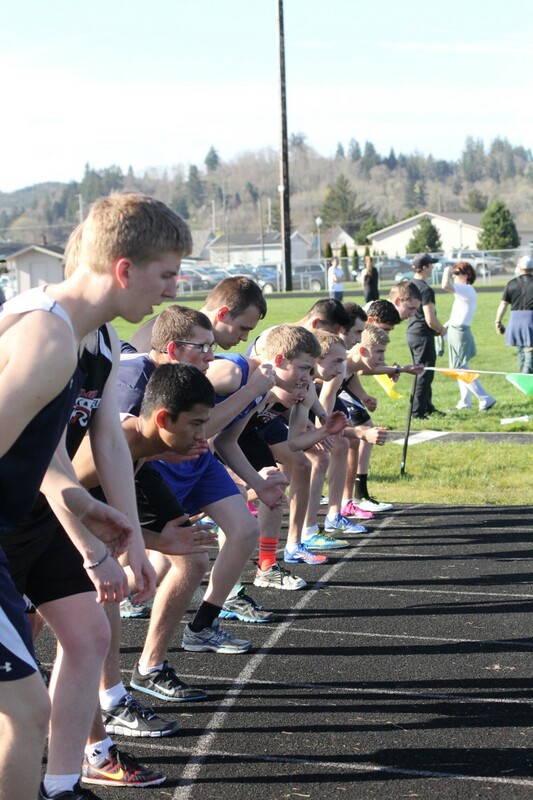 The start of the Boys 1600 meter race at Raymond HS Thursday. Raymond won the boys portion of a six-team neet at the Seagulls' track and field facility with 208 points Thursday night. Northwest Christian was second at 163, and South Bend was fourth with 94 pints. The last three teams included Tacoma Baptist, 42; Willapa Valley 8, and North river, 1. Sunday Afternoon Live's next performance takes place this Saturday, April 4, at Raymond Theatre.